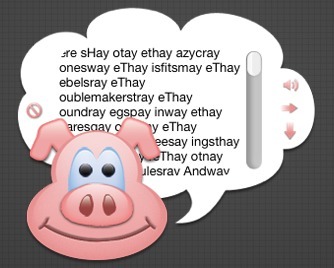 Widget that translates any text into pig latin. Is there a better alternative to Pig Latin Translator? Is Pig Latin Translator really the best app in Card and Board category? Will Pig Latin Translator work good on macOS 10.13.4? Pig Latin Translator is a Dashboard widget that allows you to enter any text and have it translated into pig latin. Simply enter the text into the speech bubble and click the pig to translate, you can then save your pig latin masterpiece or you can go back and try again. Also check out the built in texts to translate for children and adults, this widget is fun for all ages. Pig Latin Translator needs a rating. Be the first to rate this app and get the discussion started!